...... but it's a good thing! 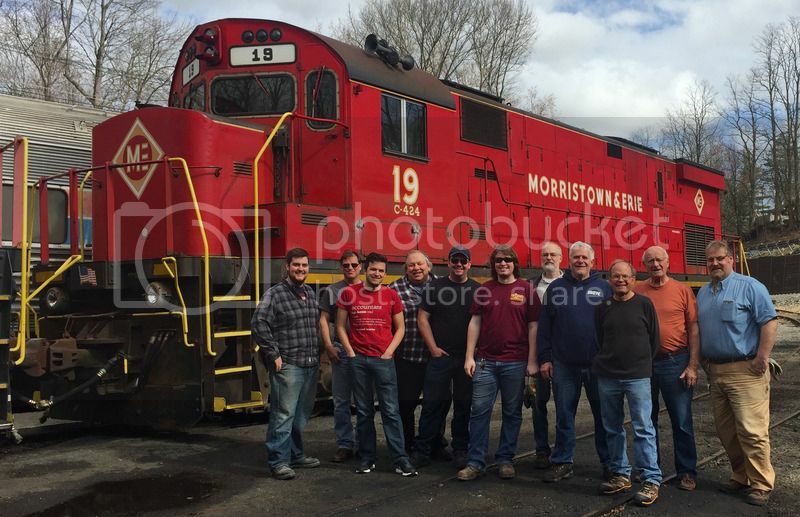 The Tri-State Railway Historical Society, Inc. (http://www.TriStateRail.org) announced yesterday that Morristown & Erie C-424 No. 19 is now the newest addition to the Tri-State collection. No. 19, which will be fully operational upon its arrival, will be the first running diesel locomotive preserved in New Jersey in over 20 years. It was taken out of service by the M&E in November 2016 following a flat spot on the #2 axle. With three new MP15DCs on the property, it was decided not to repair No. 19, and the M&E reached out to Tri-State to offer it for preservation. Liberty Historic Railway, Inc. (http://www.LHRy.org) made a generous contribution to Tri-State to cover the full purchase price of the engine from the railroad. However, we still need to raise $5,000 to replace the wheels on the #2 axle and get the locomotive operational again. Once this work is completed in Morristown, the locomotive will be moved to the United Railroad Historical Society of NJ (http://www.URHS.org) yard in Boonton, NJ for storage until a suitable location for operation is sourced. Nice trip yesterday behind M&E 19 and 18. Great people too. VERY happy that this engine will be saved and retain it's M&E colors...! Is 18 going to be sold? Scrapped? Or just kept for a rainy day? Yes, it was a very fun day and met lots of nice people, not all railbuffs! As far as 18, its not completely safe yet. The IRM is trying to raise money to purchase it and repaint it back to TP&W 800. However, they need to match the scrappers quote. It will probably run on M&E until October. I think there is an online petition to donate to save 18 , but I have to find it. Be sure to forward this to who you can. I am surprised some of the other alco-powered short lines haven't offered to buy it, at least for parts. The 18 has a few interested parties looking at it so things aren't over. I spotted 19 at the Delaware water gap in front of the tower . To make things more interesting, she was dropped of by a Union Pacific engine (and a NS). After the drop, the pair went towards Scranton which is not what I expected. Too bad my phone died or I would have posted some pix. Possibly she was coming back from having the wheel fixed or going on a new assignment. Any case good to see her on the road and also see an historic locomotive in an historic location. It was just going to Steamtown for a quick visit for Railfest weekend. My assumption is it will be returned shortly after the event. Did the 18 find a home? Haven't heard if the Illinois group raised the required funds to prevent it going to scrap. The #18 was purchased by the Illinois Railway Museum, confirmed on their website. Teutobergerwald wrote: The #18 was purchased by the Illinois Railway Museum, confirmed on their website. Correct, they must have received a substantial grant, which is obviously good to hear... Still having a hard time finding out when the move to its new home will be. That's the rub- paying to move it out there to Union, IL.